Bounce houses, fun houses, inflatable slides and party rentals are available for your next event or party in Boca Raton, Pompano Beach, Deerfield Beach and all over Broward County. Ages 2-7 – An inflatable Toddler Zoo Island or Fairytale Forest, Dora, Sponge Bob, Disney and Race car Bounce Houses will light up any child party themes. The Toddler Zoo Island has tunnels and a slide that’s safe and the right size. The tikes will enjoy Fairytale Forest that includes brightly colored soft and durable material. There is a lot of room for sliding, climbing and bouncing. Ages 8-15 – Warrior Inflatable Rock Climb Dual Slide is one of the more challenging and offers one of the biggest attractions to any child’s party. At 27 feet tall, this inflatable has two slides and a climbing rock wall in the center. The Tropical Dash offers an extra-long obstacle course with slides, tunnels, and tubes that bounce. These are both a ton of fun; they’re also safe and clean. Your son or daughter will thank you for years to come by including one of these party favors at his or her next party. 15-Up – Interactive inflatable’s such as Zorb Balls, Wipeout, or the Total Meltdown are great for any age of 15 plus. 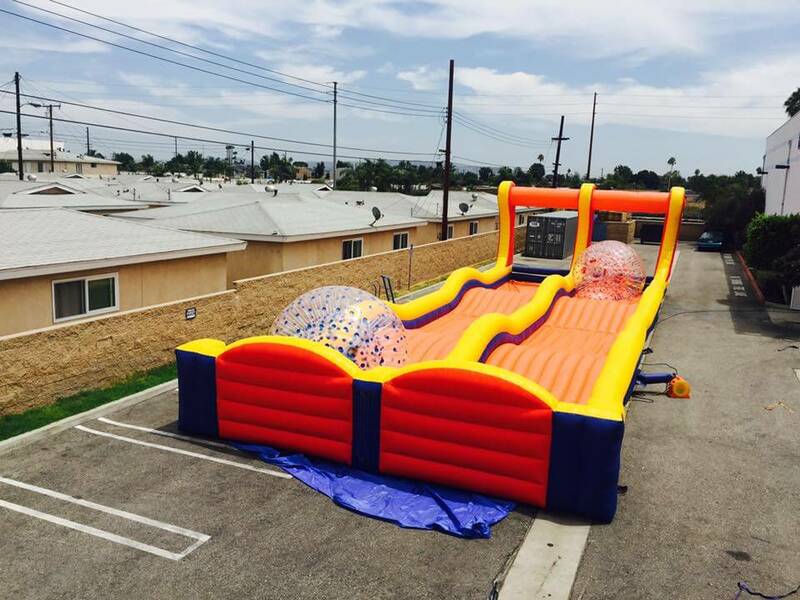 Test out your skills and stamina with Total Meltdown or crawl into a giant Zorb Ball rolling back and forth to party fun. The obstacle courses are great for agility, balance and a more challenging workout compared to our smaller models. Perfect for adults and corporate events, for teamwork. Depending on the time of year and the setting you can select both wet and dry bounce houses and slides. Keep in mind that you need to have a space of at least 20×20 square feet and up to 17 feet in height for most models. Take your time and let us help plan the party with you. You can add a hot dog or cotton candy machine and just the right amount of tables and chairs. For extra fun, include a photo booth or selfie booth. Whether your child is 2 or he or she is turning 20, a bounce house always brings an element of excitement.